(21865.4, Oklahoma Historical Society Photograph Collection, OHS). An incorporated community in eastern Osage County, Barnsdall is situated on State Highway 11, seventeen miles southeast of the Osage County seat of Pawhuska and forty miles north of Tulsa. Originally named Bigheart for Osage Chief James Bigheart, the community was officially renamed in honor of Theodore N. Barnsdall and his Barnsdall Oil Company on January 1, 1922. 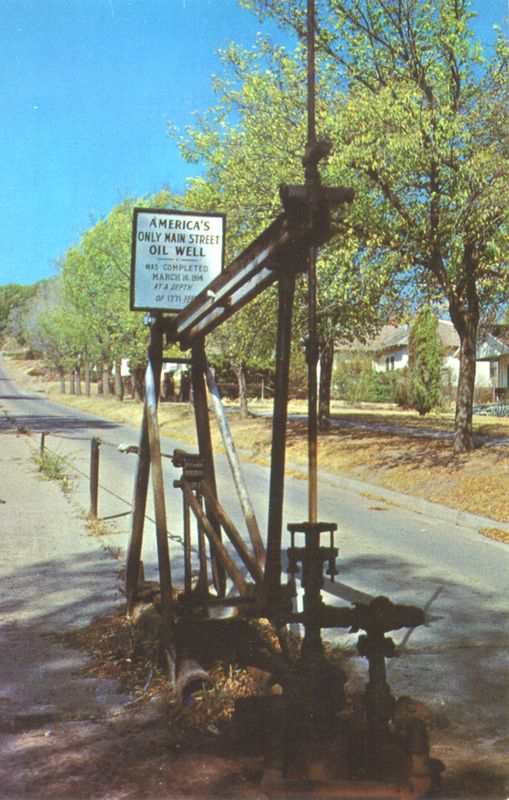 The Barnsdall Oil Company discovered the nearby Barnsdall or Bigheart Oil Field in 1916 and purchased the local Bigheart Producing and Refining Company in 1921. Bigheart began as a 160-acre townsite along the Midland Valley Railway in March 1905. The Midland Valley's Bigheart station opened in September 1905, and the Bigheart post office was established in January 1906. Bigheart was one of five townsites exempted from Osage allotment. Surveyed and platted, lots were auctioned in May 1906. Businesses and residences were constructed along the railroad right-of-way and on a hill west of the settlement. The Bigheart Star, the first of several community newspapers, started publication in 1906. Joshua S. Cosden built the Southwestern Refining Company at Bigheart circa 1910. He sold the facility in 1917, four years before its acquisition by the Barnsdall Refining Company, which was renamed the Bareco Oil Company in 1940. Bareco stopped refining in 1946 and began manufacturing microcrystalline waxes. Bareco was redesignated the Bareco Wax Company in 1952 and was subsequently purchased by the Petrolite Corporation. The plant became the world's largest manufacturer of microcrystalline waxes and remained operational into the twenty-first century. Barnsdall survived a tornado in April 1911, a fire in March 1913, and a flood in September 1915. Its population increased from 307 in 1910 to a high of 2,099 in 1920. That number decreased from 2,001 in 1930 to 1,663 in 1960 to 1,316 in 1990. In 2000 Barnsdall had 1,325 residents, an aldermanic form of government, and thirty-one business establishments, including a commercial bank, the weekly Barnsdall Times, a grocery store, and three petroleum and natural gas firms. The Barnsdall school district had an enrollment of 481. The 2010 census recorded 1,243 inhabitants. Anita Bryant (1940– ), Miss Oklahoma 1958, entertainer, and activist, is a Barnsdall native. Local properties listed in the National Register of Historic Places are the Bank of Bigheart (NR 84000311) and the Barnsdall Main Street Well Site (NR 97001153). A tourist attraction, the latter was completed by the Indian Territory Illuminating Oil Company in 1914. Nearby Birch Lake offers recreation. "Barnsdall," Vertical File, Research Division, Oklahoma Historical Society, Oklahoma City. Naomi Downing Schmidt, Our Home Town in the Osage Hills (Dallas, Tex. : Taylor Publishing, 1983). Jon D. May, "Barnsdall," The Encyclopedia of Oklahoma History and Culture, https://www.okhistory.org/publications/enc/entry.php?entry=BA023.